Many aspects of designing a stadium or arena facility are no different than most other AV projects. The primary difference is the magnitude of the design. Along with greater overall size of AV systems comes an increased amount of coordination between the owner, the architect (sometimes multiple architects), the project design team, the general contractor, and their subs. 1. Outdoor stadia aren’t affected by indoor acoustical issues such as HVAC noise levels and reverberant characteristics. 2. They are, however, subject to a different set of obstacles. For example, without acoustical room support, the designer is faced with using more directional loudspeaker systems that push the upper limit of sound pressure level output. 3. 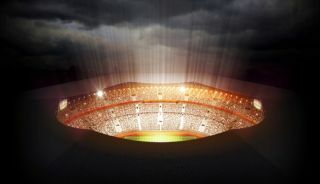 Unless the stadium has a rigid “roof” structure of some reasonable strength, the designer is limited to placing the main stadium loudspeaker systems above the bowl structure. This creates its own set of setbacks. Unless the design considers far-side reflections, the delayed return path of any reflected sound will result in audible echo. 4. Due to changes in humidity in the air from wind, etc., the high-frequency response will appear to “drift in and out.” The only partial solution here is, as stated above, to concentrate as much high-frequency energy in a more directional coverage pattern. This is where large-format loudspeaker line arrays come in handy. 5. It has become a de facto standard to use compact loudspeaker devices mounted under the roof and upper decks to cover the adjacent seating areas. This aids in providing more direct-field sound to the listeners. These loudspeaker devices are then delayed to the main rooftop line arrays, where needed. This also helps to reduce the audio power requirements from the rooftop line arrays, and subsequently reduces the effects of sound energy reflected off structural vertical surfaces. 6. All audio and video components that will come in direct contact with weather (heat, cold, humidity, rain) will be weatherized. There are several manufacturers that offer outdoor components that provide waterproof connectivity and weatherized external cabling to be routed to an adjacent weatherproof junction box. In addition, all field connectivity must be housed and protected by weatherproof enclosures, and all cabling must meet environmental specifications. 7. Regarding scoreboards, large-format video displays and ticker displays in an outdoor venue, the displays necessarily have greater requirements for display brightness. Hence the current approach always involves LED video elements. Since these displays are viewed from a distance, resolution is not as critical as it would be with near-field viewing. 8. In an outdoor stadium, you will rarely have any system operator locations placed in the open without any protection against weather. These areas such as broadcast booths, audio operator control booths, game announcer booths, etc. will usually require substantial glass viewing surfaces that exhibit a reasonable amount of sound isolation from the main loudspeakers and crowd noise. There is nothing more difficult, especially for a rookie announcer, to try to ignore reflected echoes of the sound system that are considerably delayed to the announcer’s microphone, broadcasters’ microphones, etc. It is also difficult for the audio systems operator to distinguish what is direct-field audio versus reflected audio, which will negatively affect timing cues with half time performances, etc. These aspects of stadium design for audio and video just scratch the surface of the broad spectrum of factors that must be considered in a successful project. And there are numerous design factors that mirror indoor arena design, such as AV designs for support spaces, digital signage, wayfinding, press conference/interview rooms, team rooms, recruitment rooms, training and physical therapy spaces, entertainment “club” areas, and private suites. This also includes signal routing and breakaway connectivity and requisite AC power for broadcast trucks. There is a reason that owners and architects consider multi-disciplinary consulting firms that have abundant experience in the design and coordination required for this type of facility. In-house expertise in outdoor acoustics, professional production-level live sound, and broadcast audio and video, scoreboard and large-format video displays, fiber optic network distribution, and production AC power requirements are just a few of the disciplines that make or break a project of this magnitude.